NOTE: Service currently only available with David Sosa. 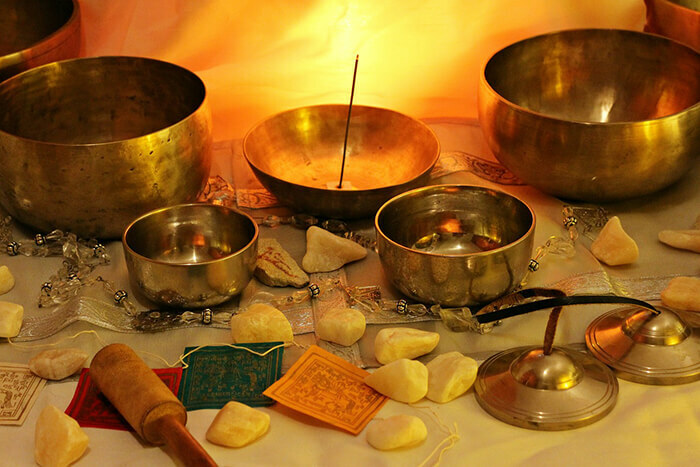 Tibetan Singing Bowls, Tingsha, and Prayer Bells $3 (per session). The sound can move the brain to into the Theta brain wave frequencies that induce deep meditative and peaceful states, clarity of mind, and intuition. Theta is the border between the conscious and the subconscious world, REM sleep (dreams), hypnosis, lucid dreaming, and the barely conscious state just before sleeping and just after waking. “If we accept that sound is vibration and we know that vibration touches every part of our physical being, then we understand that sound is heard not only through our ears but through every cell in our bodies. One reason sound heals on a physical level is because it so deeply touches and transforms us on the emotional and spiritual planes. Sound can redress imbalances on every level of physiologic functioning and can play a positive role in the treatment of virtually any medical disorder.” Dr. Mitchell Gaynor (Director of Medical Oncology and Integrative Medicine at Cornell Cancer Prevention Center in New York and author of The Healing Power of Sound).